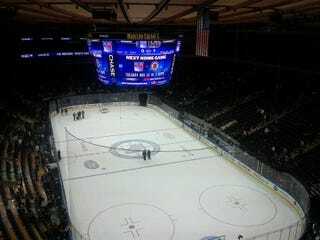 Yesterday I spent the evening at the "brand new" Madison Square Garden to watch the Kings play the Rangers. I say "brand new" since they were adding the newfangled "sky bridges." They seemed to be billed as something much closer to the action than they are in reality. They actually sit pretty close to the other seats. Anyhow, they are pretty neat. I went with a bunch of people I basically didn't know at the beginning of the night- it was a UCLA (and USC) alumni group package at one of the suites. Good times! Anybody still looking for posting privileges?